Bypassing White House slant and corporate spin. The preemptive mobilization of state police and the National Guard in Ferguson, MO, in anticipation of a grand jury's long-awaited verdict on whether or not to indict Darren Wilson, the police officer who shot and killed unarmed black man, Michael Brown, gives credence to what many activists have long claimed: We live in a police state. Gov. Nixon claimed, in a recent press conference declaring the state of emergency, that previous protests over the shooting led to wanton acts of violence by the protesters. According to Nixon, "Vandals smashed the windows of small businesses. Criminals looted and set fire to stores. Gunshots and Molotov cocktails endangered citizens exercising their First Amendment rights and law enforcement attempting to maintain peace." But the Socialist Worker's Elizabeth Schulte disputes this version of events, maintaining the protests following Brown's death were entirely peaceful. Rather, she insists, it was the police and National Guard that caused the damage and destruction Nixon cites ("Demonizing dissent in Ferguson," 11/17/2014). Indeed, CNN's Jake Tapper compared the police presence in Ferguson to "a scene out of U.S.-occupied Afghanistan," in his coverage of those August protests. "Nobody is threatening anything," Tapper said of the peaceful protesters. "Nobody is doing anything. None of the stores here that I can see are being looted. There is no violence." Tapper goes on to observe that the police are "dressed for combat." Free speech? First Amendment rights? Right of the people to "peaceably assemble... for a redress of grievances"? Such lofty ideals are promptly discarded when the corporate state shows its true oppressive face. And yet, what is happening in Ferguson right now is nothing new. It represents the same racist, authoritarian forms of control black Americans have endured since this nation's founding. Yet, sadly, many white Americans still do not get it. They insist on demonizing black Americans as "The Other," or claiming, in typical right-wing blame-the-victim fashion, that they only have themselves to blame for their problems. McLaughlin, in his latest post ("Lacking Temper," 11/18/2014), even goes so far as to claim Americans are "not buying the media spin [sic] on the incident in Ferguson...since the facts of the case don't support it." Yet, in typical fashion, McLaughlin does not bother to back up such a claim with any substantiated evidence whatsoever. Allow me to pick up the slack when it comes to McLaughlin's shoddy "reporting." Everything one needs to know about the shooting of Michael Brown is enumerated in Ryan Devereaux's point-by-point chronicle of the incident, which he contributed to The Intercept. Neither McLaughlin nor O' Reilly mentions the staggering prison rates among black Americans--particularly young black men. African Americans constitute 1 million of the nearly 2.3 million Americans in prison, according to the NAACP. Likewise, a recent report by the Washington D.C.-based advocacy group, The Sentencing Project, estimates one in three black males will go to prison "at some point in their lives." The vast majority of these men are imprisoned for petty felonies or minor drug-possession charges. Michelle Alexander's The New Jim Crow: Mass Incarceration in the Age of Colorblindness is essential reading on the subject of race in the 21st century. "Arguably the most important parallel between mass incarceration and Jim Crow," Alexander writes, "is that both have served to define the meaning and significance of race in America." The corporate state has shown its draconian hand when it comes to its preferred method of dealing with peaceful protests: It calls the police. Rather than addressing the legitimate concerns of Occupy Wall Street protesters, for example, then-New York Mayor Michael Bloomberg opted to first denigrate and then crush them with force. Fellow activists routinely attribute Occupy Wall Street's "failure" to the movement's "fizzling out," or "lack of a coherent message." Yet this popular narrative blatantly ignores the fact that the original encampment in Zuccotti Park was forcibly shutdown by the corporate state. Occupy did not fail on its own merits as this misleading account suggests. It was destroyed. Indeed, many of the police forces sent to dismantle Occupy protests were more or less hired by Wall Street banks like JP Morgan Chase and Goldman Sachs. As ProPublica's Justin Elliott revealed in a story for Salon.com ("The NYPD, now sponsored by Wall Street," 10/07/2011), in the lead up to the 2011 Occupy demonstrations several Wall Street institutions contributed millions of dollars to the NYPD, "in an arrangement that critics say compromises" the police force. JP Morgan alone donated $4.6 million. Not that this practice of the police acting as capitalism's armed-guards is anything new, of course. Even trash-talk radio host, Rush Limbaugh, understands the job of the police is to "protect wealth." [A]t bottom, political repression and crime prevention serve the same purpose. Shrewd police spokesmen can shift their rhetoric seamlessly from fighting crime to fighting political extremism and back again according to what is most convenient. And President Barack Obama's codification of the NSA's massive warrantless surveillance program has only furthered the police state. We are the most spied-upon, most video-taped and photographed people in history. Thanks to the revelations of Edward Snowden, we understand just how widespread and mind-bogglingly comprehensive the surveillance state is. Indeed, it goes far beyond anything George Orwell could have envisioned. There is no way any of this can be considered democracy. A citizenry this spied-upon, that faces constant repression by the police is in no way free. And that is why we must all stand in solidarity with the residents of Ferguson. Their fight is our fight. Members of Veterans for Peace, Boston, being arrested at the city's 2007 Veterans Day Parade. Parade organizers denied VFP permission to attend the march. They showed up anyway. Click here for the full story. Spectators at Portland, Maine's annual Veterans Day Parade last week may have noticed something odd. 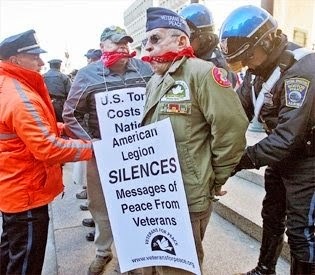 While all of the traditional veterans' groups, including the U.S. Navy, the Marines, the Air Force and the local branch of the American Legion were well represented, members of Veterans for Peace were relegated to holding their own small vigil on Monument Square while the parade passed by. Turns out Maine Veterans for Peace (Tom Sturtevant chapter), the founding branch of the nationwide antiwar protest group composed of soldiers-turned-peace activists, is more or less barred from participating in the annual Veterans Day Parade. While the group is not expressly prohibited from marching with their fellow veterans ("Veterans for War"?) in the parade, many of VFP's members feel they may as well be. Given the parade organizers' relentless attempts to marginalize and undermine VFP over the years--to say nothing of the constant barrage of verbal harassment thrown members' way by other vets and spectators--many in VFP have simply given up on the parade. The American Legion seems to be the primary antagonist in these efforts at keeping VFP out of municipal veterans' events. While the nationwide group bills itself as a "nonpartisan" organization, their political clout in perpetuating the wars in Iraq and Afghanistan has been well documented. "After many years of feeling like step-children, our chapter decided to stop participating," said Bruce Gagnon, VFP Maine secretary, who also heads the antiwar group, Global Network Against Nuclear Weapons in Space, "which likely made the parade organizers quite happy." So much, it seems, for the constant imperative to "support our troops." Perhaps the neocons and other perpetual proponents of this ubiquitous mantra should clarify the phrase: "Support our troops who support our wars." The rest of them can rot in hell. It would be one thing if this sort of treatment of antiwar groups was an isolated incident--or relegated to just Veterans Day. Sadly, neither is the case. In 2008, branches of Veterans for Peace in Washington state and Washington, D.C. were both banned from participating in their towns' Memorial Day parades. According to the story in the Daily Kos ("On Memorial Day, Veterans Dissing Veterans," 05/21/2008), both VFP groups were barred on the grounds they are "too political." Indeed, this is a common justification parade organizers and city officials cite in excluding antiwar groups and voices. But this asinine excuse implies that the parade itself, which all but glorifies war and the military, is somehow "apolitical." Everything about war--including the decision to go to war, who makes those decisions and who does the actual fighting, whether the justifications for war are legitimate and the use of military force, truly essential--is inextricably tied to politics. As Prussian general and military theorist, Carl von Clausewitz wrote in On War ("Vom Kriege"), "War is merely the continuation of politics by other means." As such, the entire parade is one giant political spectacle. Most Americans, for whom "politics" is narrowly defined as voting in elections every two to four years, simply lack the broader political and cultural understanding to view it that way. We are inculcated from childhood to revere all things military. Despite the allegedly deep and irreconcilable ideological divides which separate liberals and conservatives, The Military and The Troops remain one of the few unifying bonds. War, as Glenn Greenwald observes, has become our new religion. Voice even the mildest criticism of The Troops and U.S. Empire--a mistake MSNBC host Chris Hayes made a few years back when he gently and articulately pondered whether all U.S. soldiers should be unblinkingly referred to as "heroes"--and you become a pariah. The only reason Hayes is still on the air is because he promptly apologized for his "offensive" remarks--which he could not have parsed more carefully. But the lesson of Hayes' criticism is clear: Speak outside the acceptable parameters of discourse--as Chelsea Manning, Bowe Bergdahl, Edward Snowden, Daniel Ellsberg, and the late reporter, Michael Hastings have bravely done--and you are cast out and savagely denounced by the corporate state. And this, I suspect, is why the power elite go to such lengths to silence the voices of antiwar groups like Veterans for Peace. "They wrote in the old days that it is sweet and fitting to die for one's country," Ernest Hemingway wrote in his 1935 Esquire article, "Notes On the Next War: A Serious Topical Letter." "But in modern war there is nothing sweet nor fitting in your dying. You will die like a dog for no good reason." My paternal grandfather, Davide Dario Marletta, was a conscientious objector in Mussolini's Italy, during WWII. He spent three years in an Italian prison. Upon his release, he was extremely weak and malnourished. While conscientious objector status was still a relatively new concept at the time, Axis nations like Italy--along with France, Belgium, and the Soviet Union--had no laws recognizing their rights. Even after the war's end, my grandfather was regarded as a unpatriotic traitor by his neighbors. His pacifism made him a pariah in his own country. He and my grandmother eventually fled to Scotland, where my father was born, and, later, to the United States. Much as he hated Mussolini and the Italian Army, my grandfather claimed he would not have fought alongside the Allies, either. He simply despised war--no matter how "noble" the cause. But there are no parades, celebrations or federal holidays for conscientious objectors like my grandfather. People did not stand reverently and heap prodigious amounts of praise on him whenever he entered a room. Those, like my grandfather, who display the courage to resist war have no place in our imperial, military-obsessed culture. Indeed, I think it says something highly disturbing about our country when those advocating for an end to war and militarism--including many of those who have fought in wars and come to regret doing so--are derided as vile, blasphemous or "unpatriotic." Those who insist on celebrating--worshiping, even--war, meanwhile, are considered "non-political." These "Veterans for War," we are told, are the "realists." They understand that war is "inevitable," and always waged for "humanitarian" reasons. Yet those antiwar resisters who dare to raise their voices for peace see through these facile, childish rationales. They see war for the carnage that it truly is--"The horror! The horror!" as Joseph Conrad famously wrote in Heart of Darkness. And in denouncing the horror of war, they make the rest of us uncomfortable. The words of Hemingway are, again, instructive. A critical chapter in A Farewell to Arms, finds WWI medic, Lt. Frederic Henry rejecting the trite, cliched romanticism frequently used to describe war. Henry, in his first-person narration, explains the utter vapidity of words like "sacrifice," "glorious," and the expression, "in vain" when it comes to the battlefield. The only words that have any real significance for the jaded protagonist are the concrete, tangible names of soldiers, roads, villages, and calendar dates. ...I had seen nothing sacred, and the things that were glorious had no glory and the sacrifices were like the stockyards at Chicago if nothing was done with the meat except to bury it. There were many words that you could not stand to hear and finally only the names of places had dignity... Abstract words such as glory, honor, courage, or hallow were obscene beside the concrete names of villages, the numbers of roads, the names of rivers, the numbers of regiments and dates. A neighbor a few houses down from me has had two large signs posted on his lawn for the last month now. They read, "Save America: Vote Republican!" I imagine he is quite happy with the outcome of last week's midterm elections. 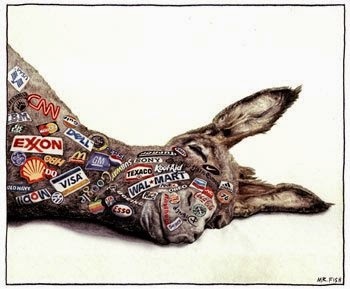 Of course, the idea that either of the two corporate parties will "save America," is absurd. Both the Republicans and Democrats are beholden, first and foremost, to corporate interests, Wall Street profits, and to furthering the permanent war economy. The truth is it matters little which party controls Congress. The policies of the Democratic and Republican parties are nearly identical. Both serve to enrich the corporate state at the expense of the poor and working class. "The divide in America is not between Republican and Democrat," Chris Hedges writes in his 2010 book, Death of the Liberal Class. "It is a divide between the corporate state and the citizen. It is a divide between capitalists and workers. And for all the failings of the communists, they got it." Here in Maine, not only was Republican Gov. Paul LePage re-elected, but he won with a bigger margin than his razor-thin victory over independent Eliot Cutler in 2010. Meanwhile, ultra-conservative tax-evader, Bruce Poliquin sailed to victory in Maine's 2nd congressional district, and "moderate" Republican Susan Collins crushed her Democratic opponent, Shenna Bellows--though there was really never much doubt she would. With Republicans now in control of both houses of Congress, many professional political pundits expect President Barack Obama to "tack to the right," policy-wise. My question for these people is where do they believe the president and the Democratic party have been operating from the last six years...? Indeed, urging Democrats to "move to the center" is the corporate media's default strategy to shutdown or delegitimize progressive reforms. While we can point to a number of factors that lead to the Democrats' trouncing (low voter turnout, lack of enthusiasm for Democratic candidates, newly-implemented voter suppression laws, the increasing role of "Dark Money," lack of youth turnout, anger at Obama, etc. ), if the Dems are looking for someone to blame, they need only look in a mirror. Given the number of controversial and highly unpopular governors on the ballot throughout the country (Wisconsin's Scott Walker, Florida's Rick Scott, Michigan's Scott Snyder, and Maine's LePage, to name a few), the Democrats should have won many of Tuesday's races, no contest. But they did not. As usual, they blew it. And it is not--despite what the media will tell you--because America is a "conservative country," after all. In fact, polling throughout the years has consistently shown Republicans' policy ideas are extremely unpopular with a majority of Americans. One need only look at the four states--Alaska, Arkansas, South Dakota, and Nebraska--and two California cities, San Francisco and Oakland, that passed referendums to raise the minimum wage for further evidence of this. No, the Democrats lost big this year for the same reason they suffered similar midterm losses in 2010: The party which, ostensibly anyway, stands for working class Americans and labor, long ago ceded the populist ground to the Republicans. Lasing out blindly and in all directions against the powerful--against low wages as well as against a comfortable "class" that is amply represented in Washington--is still our political default position, some six years after the financial crisis and the Wall Street bailout. For many Americans, the recession is still on. They know that their region hasn't recovered... that their household wealth isn't coming back... that people like them no longer have a shot at the middle-class life in which they were raised. While a great deal of it does derive from ignorance, we must understand that much of the anger that middle-class working Americans feel--even those on the right--is completely legitimate. It does not come out of nowhere. And--as the midterm elections showed--those of us on the left ignore or attempt to mock that anger at our own expense. Indeed, the greatest tragedy of Obama's presidency is that he missed a prime opportunity to unite liberals and conservatives in their anger at Wall Street for trashing the global economy. Readers may recall that Americans on both the left and the right unanimously opposed the 2008 Wall Street bailouts, or TARP (Troubled Assets Relief Program) by a ratio of 100 to 1. In fact, public opposition to the bailout was so great the initial vote on TARP in the then-Democratic-led House of Representatives failed. Then-Secretary of Treasury Henry Paulson literally got down on his hands and knees and begged Nancy Pelosi to hold another vote on the bill. "This was the largest single act of class warfare in the modern history of this country," former Ohio Rep. Dennis Kucinich said of the bailout at the time. "It is a direct attack on the American people's ability to be able to stabilize their homes and their neighborhoods... We are back to taxation without representation, to markets that are openly rigged." And Obama's failure to break up the "Too Big To Fail" banks--many of which top the Fortune 500 list--let alone prosecute any of their criminal CEOs, represents an even greater betrayal. By refusing to uphold the law and make an example out of the reckless Wall Street speculators who decimated the economy through fraud and manipulation, Obama has all but assured these hucksters will merely engage in the same behavior again. Even with the understanding that the U.S. electoral system likely makes it impossible for a truly progressive--let alone radical--president to ever take office, it is nonetheless frustrating to contemplate what could have been. Obama had a once-in-a-generation mandate to enact truly populist reforms. But he did not seize it. He rescued the banks and let "Main Street" continue to drown in debt, unemployment, low-wages, foreclosures and the bitterness of dashed dreams and unrealized expectations. My generation is the first since WWII that is expected to be worse off than our parents. "The American Dream," while always, an admittedly silly concept, is now irrefutably dead. And the Democrats killed it. The irony is old, angry, white men like my neighbor--the primary voting bloc in last week's elections--naively believe the Republicans are the party of working people. They foolishly believe the right-wing, scientifically-illiterate nutjobs that will now take charge of the government care any more about them than the Democrats do. And we are all going to suffer because of their ignorance. My neighbor should change his sign so it reads more accurately: "I love corporate fascism." George Will was right: Elections are not about "whether elites shall rule, but which elites shall rule." The late Howard Zinn once remarked of the United States' stifling two-party duopoly, "If the gods had wanted us to vote they would have given us candidates." Given the utter lack of any anti-corporate voices in Maine's upcoming congressional and gubernatorial races, I find myself agreeing more with Zinn's sentiment this year than any other election in recent memory. Putting aside the broader question of the overall efficacy of electoral politics, these midterm elections are becoming increasingly frustrating for Greens, activists, socialists or anybody looking to defy the corporate state. Sure, there is independent Eliot Cutler. But Cutler is about as "independent" as Maine U.S. Sen. Angus King. Like King, Cutler is socially liberal (i.e. he does not hate gays and women) and fiscally conservative. I prefer to think of him as "GOP-lite": Not as extreme as Republican Gov. Paul LePage, but not particularly moderate, either. A former corporate lobbyist who is largely self-financing his own campaign, Cutler talks of "branding" the state of Maine like a corporation. He supports tax reform, merit-based pay for teachers, eliminating--rather than reforming--government programs that are inefficient, and "reforming" welfare in a language reminiscent of Bill Clinton. 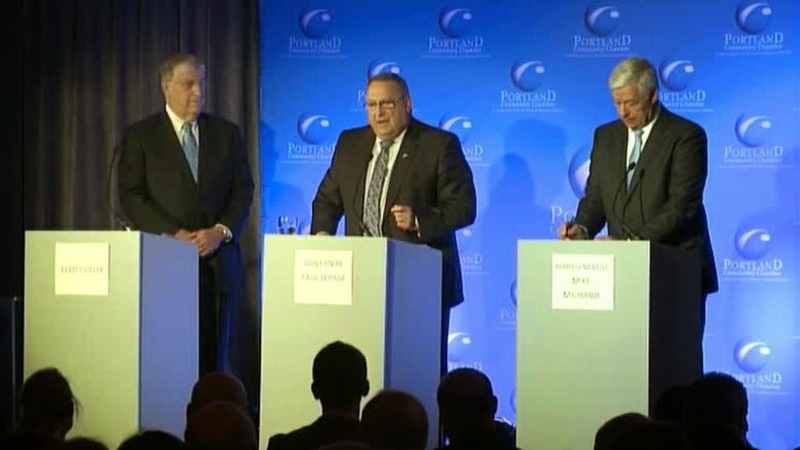 And, in his previous bid for governor in 2010, Cutler and LePage both cited New Jersey Gov. Chris Christie as a politician they admire. In other words, Cutler is another Establishment politician. He would fit right in with either the Republican or Democratic parties--which makes sense, since he has been enrolled in both parties before going independent. All of that said, I find the persistent calls for Cutler to drop out of the race highly antidemocratic. Even if I do not personally support his policies, Cutler has a constitutional right to run for public office. As voters, we should be encouraging more candidates to run for office. And we could do just that if Maine adopted a ranked-choice or instant run-off voting system for all statewide elections--just like Portland uses to elect the mayor. However, Maine Democrats resist any calls to reform our antiquated winner-take-all electoral system. They likely realize that, if given a choice, progressive voters would abandon them in droves. Then we have Democratic U.S. Rep. Mike Michaud, a candidate almost as bland and uninspiring as former U.S. Rep. Tom Allen. Like Allen, Michaud's career in the House of Representatives has been colored by his rank-and-file party loyalty, his utter lack of leadership qualities, and a record that, above all, demonstrates a thorough refusal to rock the boat in even the slightest manner. In a succession of flip-flops to rival John Kerry, Michaud was opposed to women's reproductive freedom before he was for it. During his first year in Congress, Michaud earned a ten percent rating from the leading women's advocacy group, NARAL Pro-Choice America, one of the worst ratings the group has ever given. Now, the very same group has endorsed him for governor, praising Michaud's "evolution" on women's rights. "We know he'll be an excellent advocate for women," writes NARAL president Ilyse Hogue in an op-ed in the Portland Press Herald/Maine Sunday Telegram ("Mike Michaud has earned pro-choice group's endorsement, abortion rights advocate says," 04/30/2014). Likewise, Michaud opposed gay rights before he came out as gay himself, shortly after announcing his intent to run for governor last fall. Even in the lead-up to Maine's passage of gay marriage in 2012, Michaud remained completely silent on the issue. He could have, at the very least, expressed his support for the ballot measure. Doing so would not even have necessitated disclosing his own sexual orientation. As obnoxious as LePage is, at least the man has principles and, in the eyes' of his supporters anyway, integrity. And that is, sadly, why he will likely be re-elected. Finally, there is U.S. Senate hopeful, Shenna Bellows who is running an uphill contest against long-serving "moderate" Republican Sen. Susan Collins. Sure, Bellows is highly unlikely to win. But let's put that pesky fact aside for the moment. Yet, while Bellows has clearly staked out a populist campaign (and there is no debate that Collins has long overstayed her welcome in Washington, D.C.), she, like 2012 Senate hopeful, Cynthia Dill, is something of a sacrificial lamb for the Democrats--put up more for show than as a serious contender. Readers may recall that Dill, who was vying for the U.S. Senate seat vacated by Olympia Snowe, received virtually no backing from the Maine Democratic Party, which threw its support behind eventual winner, Angus King. As Press Herald reporter Kevin Miller writes in a recent story on Bellows' "quixotic" campaign, "Bellows has raised more than $2 million--far less than her opponent, but a respectable sum for a campaign that has received little fundraising help from a Democratic Party focused elsewhere" ("Race for the U.S. Senate: The first-timer," 10/12/14). But candidates like Bellows--who, on the face of it at least, support everything the Democratic Party ostensibly stands for--nonetheless serve a purpose. That purpose is to draw jaded, betrayed liberals back into the Democratic Party. As Elizabeth Schulte explains in a recent piece on Elizabeth Warren--whom many have compared to Bellows, including Bellows herself--for the Socialist Worker, "Like so many other liberal figures before her, Warren's main impact is to put a populist facade on a Democratic Party that stands for preserving corporate power" ("The progressive face of a regressing party," 10/20/2014). The hope among so many Democratic liberals is that people like Elizabeth Warren will bring the Democratic Party back to its true populist roots. But the opposite is true. The role of liberal figures like Warren--like Dennis Kucinich or Jesse Jackson or many more before them--is to pull progressive supporters of the Democrats back to the party at election time. After all, the Dems can't risk alienated liberal voters leaving the Democratic Party for, say the Green Party, can they? Even despite Bellows' all but certain defeat at the polls, many Democratic insiders believe she is "laying the groundwork" for subsequent campaigns. And therein lies the real function of figures like Bellows. Even if Bellows were to win on Election Day, she would, in all likelihood, promptly abandon her progressive platform and, like Warren, fall in lockstep with the Democratic rank-and-file. No, Shenna Bellows will not save us. Nor will a Gov. Mike Michaud or Eliot Cutler. The only hope for true progressive change--in Maine and nationwide--is by breaking away entirely with the two-party corporate duopoly. All of the major democratic reforms throughout history--from the right of women to vote, the civil rights movement, labor rights, regulatory and environmental reforms--have come from outside the two-party system. Even FDR had to be dragged, kicking and screaming, to enact his New Deal policies--though one would never know it from high school history class or Ken Burns' recent hagiographic documentary, The Roosevelts: An Intimate History. It was only through the hard-won struggles of socialists, anarchists, feminists and labor leaders that we gained Social Security, child labor laws, Medicare/Medicaid, workers' comp., the five-day, 40-hour work week and weekends off. Few of the activists behind these struggles ever achieved formal positions of power. To be clear, I am not advocating not voting--though, at the same time, I can perfectly understand why some voters might choose to stay home next Tuesday. And yes, I too can't stand LePage. The man is an arrogant, ignorant bully. But I can't stand Michaud, either. And I gave up on voting for the "lesser evil" a long time ago. "I'd rather vote for what I want and not get it," socialist leader and perennial presidential candidate, Eugene Debs said, "than vote for what I don't want and get it." What do you think of this essay-style op-ed? Did you love it? Did you hate it? Why? Will you consider making a donation? It's really easy to do and helps keep this blog going. As always, thanks for reading. 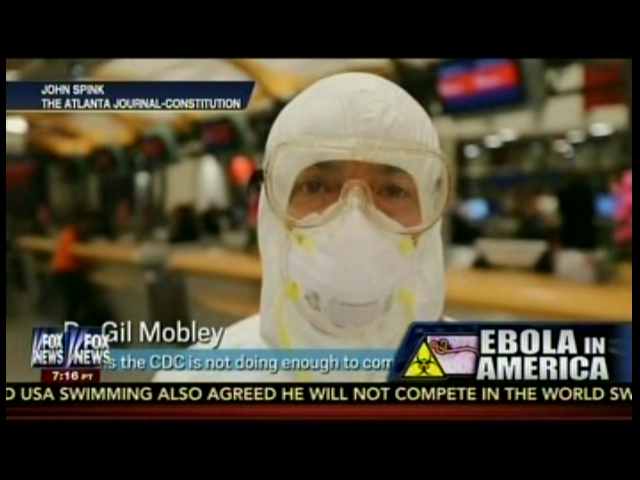 A screenshot from Fox News' Sean Hannity Show. Forget about Ebola. The real disease is capitalism. America is a strange country--a "land of superstition," as Henry David Thoreau wrote. Our sensationalized, "If-It-Bleeds-It-Leads" corporate media has us all scared to death of Ebola, even though your chances of actually contracting the disease are pretty minimal. Meanwhile, anthropogenic climate change is causing the planet to hurtle full-throttle toward a catastrophic 4-6 degree rise in temperature, yet the media do not seem to be that concerned. But try telling that to the average Fox News-watching American. That is not to say Ebola is completely harmless. It is not. Officials at the Centers for Disease Control (CDC) are right to take proper precautions to prevent the disease from spreading. But, as AlterNet's Larry Schwartz points out in a recent article titled, "Ebola is Scary, But These 6 Things are a Lot Scarier" (10/15/2014), we have far more to fear from lack of gun control, smoking, vehicular fatalities (wherein the victim was not wearing a seat belt), and over-consumption of alcohol which is responsible for over 88,000 deaths annually. Schwartz, a health, science and nutrition writer, goes on to explain that the only way to become infected with the Ebola virus is through direct contact with a victim's "blood, vomit, or other bodily fluid," via one's "eye, mouth, nose or [an] open cut." "Ebola is very hard to get," he writes. "Period." Schwartz goes on, "Americans tend to worry a great deal about illnesses they shouldn't worry about, while at the same time not worrying about very real threats to their health." So wash your hands, folks (with soap and warm water--not that generic Purell crap), and chill out. The Ebola outbreak is not the long-anticipated "zombie Apocalypse" many have feared and/or hoped for. But if you want to talk about something really frightening, let's consider how the U.S. for-profit health care system impacts the Ebola epidemic. Indeed, our lack of universal health care both hinders efforts to contain (and ultimately treat) the virus and almost assures it will spread further. Consider, for instance, the budget-cutting austerity measures politicians have enacted on most of the West and parts of Europe. Much has been made of Texas Health Presbyterian Hospital's botched response to the death of Thomas Duncan, the first person to die from Ebola in the U.S. on Oct. 8. While conservatives have pointed to the hospital's failure to properly diagnose Duncan and its various other missteps as evidence that "Big Government" is incompetent and incapable of responding to widespread health emergencies, if anything, these failures are more an indictment of the (fictional) "free-market." In fact, the budgets for both the CDC and the National Institutes of Health (NIH) have been cut in recent years in the name of austerity, according to the New York Times. The NIH saw its budget decrease from $31.2 billion in 2010 to $30.1 billion in 2014. Likewise, the nurses who treated Duncan at the Dallas hospital were woefully ill-equipped to properly protect themselves from exposure to the virus--again, due to budget-cuts and a lack of clear protocols. According to the Los Angeles Times, nurses at THPH "described a hospital with no clear guidelines in place for handling Ebola patients..." And their protective gear was almost laughably inefficient, consisting of "gloves with no wrist tapes, gowns that did not cover their necks, and no surgical booties" according to the Times' story. As Nicole Colson states in an article for the Socialist Worker (10/16/2014), "The idea that critical government agencies in charge of protecting the public health could have their budgets slashed in the richest country on earth is absurd." Yet, in a move straight out of the Ayn Rand screw-the-workers-playbook, THPH and health officials are placing blame for Duncan's death on Nina Pham and Amber Vinson--the two nurses who treated him. CDC Director Dr. Thomas R. Frieden claims 26-year-old Pham became infected with Ebola due to her own "protocol breach," in a press conference shortly after Duncan's death. It is worth pausing to ponder why it is that Europeans are not freaking out about Ebola the way we are in the West. Much of it could be due to the fact that most European countries have two vital worker-health laws the U.S. lacks: Single-payer health care and paid sick-leave. One reason Europeans are not in a state of hysteria about Ebola the way the US public is, besides the confidence Europeans have in their universal health care systems, is that they know that waiters, maids and housekeepers have a right to paid sick leave, so they are not going to be on the job infecting others if they get the disease. They'll be availing themselves of free or next-to-free healthcare and getting tested and if necessary, treated. The nurses' union, National Nurses United (NNU) has made a similar argument. "As NNU pointed out in a statement," Colson writes in her piece, "because the U.S. lacks a national health care system, preparedness for a crisis like Ebola is woefully uneven from hospital to hospital." America remains the only industrialized country in the world that does not treat health care as a basic human right. Even post-invasion Iraq has single-payer health care as guaranteed by the Bush-drafted and Iraqi-approved 2005 constitution. In other words, single-payer is good enough for the people of the countries we illegally invade and "democratize" via gunpoint, but not for citizens of our own country. So take a deep breath, America. Turn off the fear-mongering cable-news talking heads. Many of them are simply using the Ebola outbreak as an excuse for racism. There is plenty of truly scary stuff out there to be worried about--capitalism being chief among them. Like this blog post? Consider making a donation via the "Donate" button on the right of the screen. Any amount is greatly appreciated and helps keep this blog running. Guerrilla Press does not get cushy grants, or advertising dollars. We don't win Portland Phoenix awards. You alone keep this blog going. 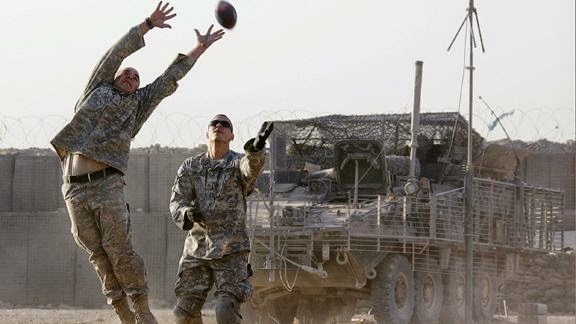 On the intersection between sports and militarism. Is there any greater evidence of the violence routinely celebrated in American culture than the popularity of professional sports? The question is not meant to be hyperbolic or rhetorical. No doubt spectator sports, like any other form of popular entertainment, play a role in pacifying and distracting citizens from more pertinent civic matters. The Romans had their gladiator games--their "bread and circuses." We have our Super Bowls. But, at the same time, sports also reinforce imperial sentiments of war, competition, sexism and homophobia, aggressiveness, and an "us-versus-them" mentality fostered by team rivalries like that between the Boston Red Sox and the New York Yankees. While there is nothing wrong with a little healthy competition--indeed, it is an integral part of the game--Red Sox and Yankees fans take this bitter, often vulgar rivalry so far one would think the two sides are not competing baseball teams but feuding mobsters, each sworn to the other's destruction. It is not a stretch to see the same sort of "Otherness" Yankees fans take on in the eyes of Red Sox supporters replicated in the "War on Terror." Muslims at large have become the new Communist--a terrorist "Other" from a supposedly backward, barbaric part of the world we Americans do not--and make no effort to--understand. As a result, sports are the perfect method of indoctrinating young people into the militarism of American empire--if not into the U.S. military itself. We often hear African Americans talk of the "school-to-prison pipeline," in comparing the two authoritarian environments. Consider high school and college athletics the "sports-to-military pipeline." As world-renowned linguist and political dissident, Noam Chomsky observes in the 1992 documentary film, Manufacturing Consent: Noam Chomsky and the Media, (based on the book of the same name which Chomsky co-wrote with Wharton School Professor Edward Herman) sports serve as a way to instill in young people "irrational attitudes of submission to authority," along with "group cohesion in irrational jingoism." Certainly, these are traits well suited to the young solider recently deployed to Afghanistan, Iraq, Syria, or one of the other numerous nations we are currently involved in. George Orwell was more blunt in his assessment of sports. "Serious sport has nothing to do with fair play," Orwell wrote. "It is bound up with hatred, jealousy, boastfulness, disregard of all rules, and sadistic pleasure in witnessing violence. In other words, it is war minus the shooting." Nowhere was this link between sports and the military more abundantly clear than at Kennebunk High School's recent "Armed Forces Night," in my hometown of Kennebunk, Maine. The newly-launched "thank-you-for-your-service" ceremony, which started last year, honors current, former and "fallen" local soldiers during the KHS early October football game. The event is the brainchild of KHS assistant football coach Nick Parent. In a story (10/18/2013) in the local weekly rag, The Kennebunk Post (the free paper is little more than advertisements, press releases, and feel-good puff pieces), Parent mouthed the same tired, empty platitudes to "supporting the troops," who "fought for our freedom," we are routinely bombarded with by politicians, the media, and popular culture. The crowd at the Armed Forces Night game cheered jubilantly at every mention of the army. Many of them, including the cheerleaders, wore camouflage-colored bracelets that said, "U.S. Armed Forces." Throughout the game, several local veterans were called to the field and singled out for their service. Yet there was no mention of drone strikes, targeted assassinations, the surveillance state, or the very real and chilling fact that, under the National Defense Authorization Act (NDAA), anybody in the audience could be randomly swept up by the government, at any time, for any reason, and imprisoned indefinitely with no trial. I guess those inconvenient facts would have dulled the otherwise celebratory atmosphere of the night. The rousing pop-songs by artists like Lady Gaga and Miley Cyrus that intermittently blared through the speakers further reinforced the sentiment that war is one giant party. And you, too, can be invited. Sign up here. It all begs the question: To what extent do events like this serve as an elaborate recruitment tool for the U.S. military? Furthermore, what sort of message are we sending our children when public schools appear to be pushing the military as a worthwhile and perfectly reasonable career option? Indeed, the unspoken irony of the night was the fact that schools and universities throughout the nation are seeing budgets, faculty, staff, and resources slashed, while we ramp up our numerous and ever expanding wars against ISIS in Syria and our recent recommitment in Iraq. Over 50 percent of our federal income taxes go to the "Defense" budget. Then again, sports teams like The Kennebunk Rams will likely be spared. It is the music, theater, and liberal arts classes that are always first to go in times of fiscal crises. Sports? They're sacrosanct. But war is not a game. It is nothing like Saving Private Ryan or other glitzy Hollywood war movies. Soldiers do not return from war as hypermasculine warrior-heroes. As former New York Times foreign correspondent, Chris Hedges, points out, most Americans have little concept of the true horrors of war. And given our all-volunteer army, the majority of us spend precious little time even thinking about our state of permanent war. They have become an abstraction that we simply tune out in favor of American Idol or Downton Abbey. So by all means, root, root for the home team, if you so desire. Just be sure you understand what it is you are really rooting for: "War minus the shooting." Attorney General Eric H. Holder's announcement last week that he intends to leave the White House after six years in the Obama administration has lead to a series of debates among the cable-news talking-heads and political elites about his legacy. Given how absolutely abysmal Holder's stint as attorney general has been, such "debates" need not be very long. Good riddance, I say. 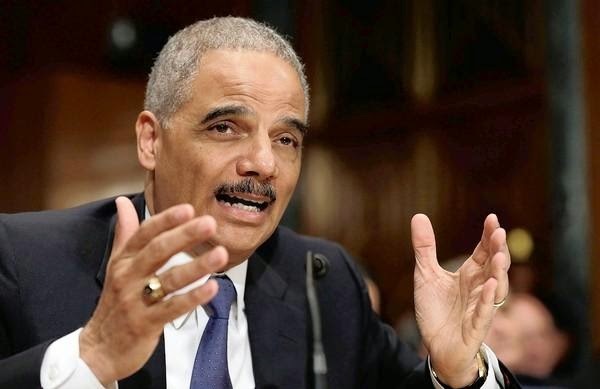 As the nation's first African American attorney general--and the last remaining of President Obama's original cabinet members--Holder has presided over the largest expansion of executive power in U.S. history. Rather than rolling back the Bush administration's worst excesses and abuses of power, Holder has allowed Obama to codify them into law, ushering in a frightening "new normal." He has overseen the continuation and militant expansion of the "War on Terror,"--a Cold War-style conflict which, by design, can never end. Holder has codified torture as a legitimate (and legal) method of prisoner interrogation, as well as the outright killing of U.S. civilians (and their children). Holder has been a key ally in Obama's unprecedented war on journalists and whistleblowers. Indeed, embattled New York Times investigative reporter James Risen calls President Obama, "The greatest enemy of press freedom in a generation." Risen is currently facing jail time under the Espionage Act for refusing to reveal a source and testify against a former CIA agent accused of leaking state secrets. 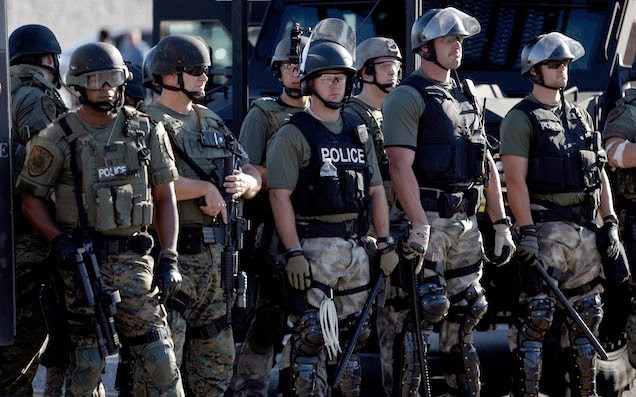 Likewise, Holder has overseen the most rampant militarization of municipal police forces, which have proven quite effective at breaking up peaceful demonstrations like Occupy Wall Street and those in Ferguson, MO. And, as the nation's top law enforcer, Holder has refused to hold any of the CEOs or other managers of the "Too Big to Fail" Wall Street banks that torpedoed the global economy accountable for their crimes. He has, furthermore, resisted following the logic of "Too Big to Fail" (hence, "Too Big to Jail") to its logical conclusion, and broken-up the largest conglomerate banks like JPMorgan, Bank of America, and Citigroup. In the words of former bank regulator, William Black, speaking to The Real News Network (09/29/2014), Holder is going to leave the Justice Department, "without even a token conviction." Not exactly a record to brag about, if you ask me. True, there have been a handful of progressive gains under Holder surrounding civil rights, gay marriage, and the war on drugs. But most of these victories are the result of the attorney general's refusal to enforce various laws, rather than--with the exception of the Defense of Marriage Act--any substantial change in the laws. As a result, it is difficult to view Holder's record on civil rights, voting rights, etc. as actual "victories," since the next AG could well reverse course, and simply go back to enforcing the laws Holder chose to ignore. Yet, it is this handful of half-measures many within the liberal intelligentsia would prefer to focus on as Holder plots his departure. A recent editorial in The Washington Post ("Eric Holder's legacy: Protecting civil rights," 09/26/2014) is a case in point, offering high praise for Holder's record on voting rights. "Democracy depends on everyone having unencumbered access to the voting booth," the editors write. And while this is no doubt true, does democracy not also depend on every citizen's right to due process...? The Op-Ed makes no mention of Anwar al-Alwaki or the use of drones. Georgetown University Professor Michael Eric Dyson, likewise, is another Obama-apologist who would prefer to accentuate the positive. In a recent debate on Holder's legacy on Democracy Now! (09/26/14), Dyson, along with NAACP legal defense fund director, Leslie Proll, praised the outgoing attorney general as "one of the nation's finest and most extraordinary." Proll goes on to compare Holder to Robert Kennedy. Dyson, meanwhile, dismisses criticisms of Holder's failure to prosecute Wall Street bankers as an "abstract" issue, a phrase he uses multiple times. "[W]hen we look at his [Holder's] record," he says, "we've got to put it in the context of the abstract versus the real, the abstract versus what is achievable..."
Dyson would do well to get out of his ivory tower and talk with some of the people--the majority of whom are people of color--who lost their homes, filed for bankruptcy, lost their jobs or endured some other form of very real financial, emotional or psychological hardship as a result of the Great Recession. Try telling them their concerns are "abstract." Furthermore, Dyson's insistence that Obama had no choice but to bail out the financial institutions that ravaged the economy--"...you can't overcome that [hypothetical newspaper] headline...'Nation's First Black President Allows the Financial Institutions to Fail'"--ignores the fact that a majority of Americans--conservatives, liberals and independents--opposed the Wall Street bailout. In other words, had Obama simply invoked the (supposed) "free-market" orthodoxy and told the banks to sleep in the beds they had made for themselves, he would have been on the same side as majority popular opinion. But Dyson is more afraid of what the corporate, Wall Street-owned newspapers might think. This why I maintain identity politics destroyed the left. Saint Augustine was right: "In the absence of justice, what is sovereignty but organized robbery?" Fellow progressives derided my calls for Bush and Cheney's impeachment in the flagging years of their second term as a "distraction." Obama, likewise, urged Americans to "look forward rather than backward" with regard to the war crimes and gross violations of power of his predecessor. But here is the problem with that lofty approach: Law enforcement is inherently about "looking backward," because, outside of the dystopian movie, Minority Report, crimes take place in the past. Hence, the entire purpose of criminal investigation is to recreate or retrace events that have already occurred in order to identify and arrest those responsible. As for impeachment being a "distraction," if that is the case, it seems odd that the framers of the U.S. Constitution mention the legislative process six times. Indeed, this was when I realized that, according to the narrow parameters of contemporary U.S. politics, those who support enforcing and upholding the rule of law are considered "radicals." Conversely, those who have no trouble ignoring war crimes and torture committed by their own government, are deemed "moderates." The most regrettable aspect of, not just Holder's tenure, but Obama's overall presidency, is the tragic missed opportunity. Obama could have pulled the reins on Bush's worst excesses. Indeed, many on the left who elected Obama--not once, but twice--believed that was what they were voting for. In closing, Holder has been an obedient and faithful servant to the corporate state. Celebrate him if you want. But history will likely be a far harsher judge. Help keep this blog running by making a donation today. Any amount is greatly appreciated. If you like what you read here on Guerrilla Press, please consider making a donation. Twenty dollars, $10, $5 or even just $1--anything you can give is greatly appreciated.